Secretary of State says intelligence released by Israel on Iran is authentic and includes new information. 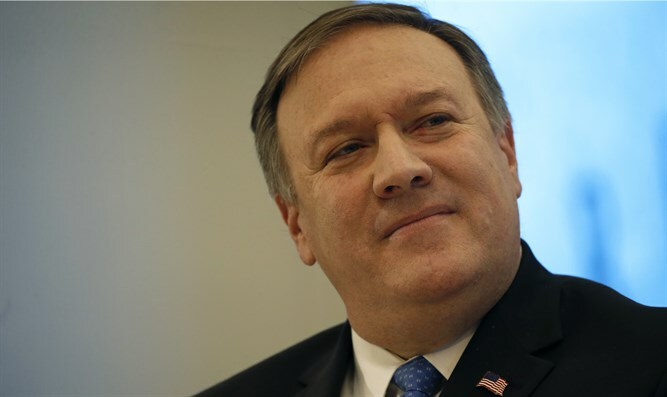 U.S. Secretary of State Mike Pompeo said on Monday that Israel's newly released package of intelligence on an Iranian nuclear weapons program was authentic and acknowledged that much of it was new to American experts. Pompeo, who visited Israel on Sunday and met Prime Minister Binyamin Netanyahu, was briefed on the material, he told reporters on his plane. "We've known about this material for a while and we certainly discussed this material yesterday when we were together," said Pompeo, who served as CIA Director before being appointed Secretary of State. "It's been something that's been in the works for a while. I know that there are people talking about these documents not being authentic. I can confirm with you, for you, that these documents are real, they are authentic," he added. "It's accurate to say that the knowledge of that, the fact of that, has been known for quite some time, but there are thousands of new documents and new information," he stated. "We're still going through it, there's still a lot of work to do to figure out the scope and scale of it, but it is the case that there is new information about that program." Netanyahu revealed the intelligence information on Iran in an address to the media earlier on Monday. The information, said the Prime Minister, proves that "Iran lied big time" when its leaders denied that the Islamic Republic had a program to develop nuclear weapons. He also noted that after Iran signed the nuclear deal in 2015, it intensified its efforts to hide its secret nuclear files and in 2017 moved its nuclear weapons files to a highly secret location in Tehran. Supporters of the 2015 Iran nuclear deal, which President Donald Trump is expected to pull the U.S. out from on May 12, have argued that Netanyahu's intelligence release deals simply with a historic Iranian program and does not prove they are in breach of the 2015 accord. Pompeo, however, argued that it has some value in the current debate. "This will, I think, spell out the scope and scale of the program that they undertook there, and I think that it makes clear that at the very least the Iranians have continued to lie to their own people," he told reporters, according to AFP. "The Iranians have consistently taken the position that they've never had a program like this. This will belie any notion that there wasn't a program," he added. Pompeo said that Trump would have to determine whether the United States feels Iran is in violation of the deal, and said American translators and analysts are still trawling through the intelligence provided by the Israelis.